Department of Pharmacology 1, Parul Institute of Pharmacy and Research, Waghodia - 391760, Gujarat, India. Department of Pharmacology 2, L. M. College of Pharmacy, Ahmedabad - 380009, Gujarat, India. Department of Zoology 3, The Maharaja Sayajirao University, Vadodara - 390002, Gujarat, India. ABSTRACT: Withania somnifera is a traditional indigenous plant having numerous medicinal values. With renewed interest, the present study was undertaken to determine its new potential therapeutic benefit. We aimed to evaluate the effect of methanolic extract of Withania somnifera leaves in L-methionine induced hyperhomocysteinemia in rats. Wistar rats (250-300 gm) were divided into 5 groups (n=6/group): Group I= Normal control (vehicle, 1% CMC); Group II= Hyperhomocysteinemic rats (L-methionine, 1 gm/kg, p.o. ); Group III= Methanolic extract of Withania somnifera (200 mg/kg, p.o. ); Group IV= Methanolic extract of Withania somnifera (400 mg/kg, p.o. ); Group V= Folic acid (1 gm/kg, p.o.). All the rats except normal control group were treated with L-methionine for the induction of hyperhomocysteinemia. Animals of Group III-V were subjected to the respective treatment for 30 days. On completion of the study, serum homocysteine, cholesterol, triglyceride, LDL, VLDL, and HDL level were determined. Administration of L-methionine significantly increased the serum homocysteine, cholesterol, triglyceride, LDL, VLDL levels while decreased HDL level compared to normal control. Methanolic extract of Withania somnifera (200 and 400 mg/kg) decreased serum homocysteine level, improved lipid parameters by decreasing cholesterol, triglyceride, LDL, VLDL levels and increasing HDL level. The homocysteine and lipid-lowering potential of Withania somnifera in higher dose (400 mg/kg/d) were found in an extent similar to the folic acid, (standard drug). These findings indicate clear evidence that the methanolic extract of Withania somnifera treatment has a beneficial effect in lowering homocysteine level. The effect may be due to the presence of high catechin content in leaves of Withania somnifera. INTRODUCTION: Homocysteine is an emerging new risk factor in cardiovascular disease with a significant correlation among hyperhomocysteinemia and cardiovascular disease and its related complications such as stroke, heart attacks, and atherosclerosis 1, 2. Further, hyperhomocysteinemia is linked with an increased risk of several other diseases as such in deep vein thrombosis, dementia and Alzheimer disease 3, 4. Homocysteine is non-protein sulfur comprising an amino acid, metabolic intermediary derived from the essential sulfur-containing the amino acid, methionine. Hyperhomocysteinemia is implicated in endothelial cell damage, altered hemostasis, enhanced lipid peroxidation, vascular smooth muscle cell proliferation and inflammatory responses 5. Additionally, hyperhomocysteinemia is accompanied by decreased vascular reactivity via triggering oxidative stress and reducing nitric oxide (NO) 6. Interestingly there are growing pieces of evidence, suggesting natural anti-oxidants in overwhelming high level of homocysteine. Withania somnifera (W. sominifera), commonly known as Ashwagandha (winter cherry) belonging to family Solanaceae. It is widely used indigenous medicine for more than 3,000 years with high medicinal values. Various reported medicinal uses of W. somnifera are analgesic, anti-inflammatory, anabolic activity 7. Numerous studies indicated immunomodulatory, antidepressive, antioxidant, antitumor, antistress, antiaging, anxiolytic 8, cardioprotective 9 and neuroprotective 10 activity of W. somnifera. Interestingly beyond these reported copious benefits, the effect of W. somnifera on homocysteine level has not been reported. The main active chemical constituents present in W. somnifera are alkaloids and steroidal lactones. Among them, the pharmacological activity is attributed due to withanine and withanolides. However, recently Nadia et al., demonstrated the presence of high content of catechin in leaves of W. somnifera 11. Also, a recent study showed a beneficial effect of catechin in reducing plasma homocysteine levels 12. Therefore we aimed to study the effect of methanolic extract of W. somnifera leaves in L-methionine induced hyperhomocysteinemia in wistar rats. Plant Material: Withania somnifera plants were identified and collected from the botanical garden of Parul Arogya Seva Mandal, Vadodara and were authenticated (PIPR/13/07) by Dr. A. S. Reddy, Department of Bio-science from Sardar Patel University, Vallabh Vidyanagar. Leaves of W. somnifera were used for the preparation of methanolic extract. Preparation of Methanolic Extract of Withania somnifera: Leaves of the plant were collected and washed thoroughly 2-3 times with distilled water. The leaves were air-dried under shade. The dried leaves were crushed to fine powder and passed from sieve #40. The dried powder was refluxed with (15 g/200 ml) methanol in Soxhlet apparatus for extraction. The extract so obtained was filtrated, and excess solvent was allowed to evaporate at 40°C in water bath 13. The extract was stored and used throughout the study. Phyto-chemical Screening: Preliminary phyto-chemical studies of the extract were performed to determine the presence of alkaloids, flavonoids, saponins, glycosides, phenols, steroids, tannins and terpenoids according to the standard chemical tests Table 1. Animals: The protocol (984/12/05) of the experiment was approved by the Institutional Animal Ethical Committee as per the guidance of the Committee for Control and Supervision of Experiments on Animals (CPCSEA), Animal Welfare Division, New Delhi, India. Wistar albino rats (250-300 gm) were used for the experiment. All Rats were kept at ambient temperature (22 ± 2 °C), relative humidity (55 ± 5%) and 12/12 h light/dark cycle. Animals had access to standard pellet diet and water was given ad libitum. Chemicals: L-methionine, folic acid, carboxy-methyl cellulose (CMC) was purchased from Chintan Enterprise, Baroda, India. HDL, cholesterol, triglyceride, LDL, VLDL kits were purchased from span diagnostic, Surat, India. Homocysteine kit was purchased (Biomatik, USA). Induction of Hyperhomocysteinemia in Rats: Rats were divided into five groups. Group 1: Normal control [CMC (0.5%)]. Group 2: Disease control (Hyperhomocysteinemic rats). Group 3: W. somnifera (Methanolic extract, 200 mg/kg, p.o) treated hyperhomocysteinemic rats. Group 4: W. somnifera (Methanolic extract, 400 mg/kg, p.o.) treated hyperhomocysteinemic rats. Group 5: Folic acid (100 gm/kg, p.o.) treated hyperhomocysteinemic rats. Hyperhomocysteinemia was induced by administration of L-methionine (1 gm/kg, p.o.) orally for 30 days. Treatment of W. somnifera (200 mg/kg/d and 400 mg/kg/d) and folic acid (1 gm/kg) were co-administered with L-methionine for 30 days in the respective groups. At the end of the experiment serum, homocysteine level and lipid parameters (Cholesterol, triglyceride, HDL, VLDL, and LDL) were determined in all the rats. Measurement of Homocysteine: Serum was separated from blood samples and was used to measure homocysteine using by Enzyme-Linked Immunosorbent Assay (ELISA) kit (Biomatik, USA). Measurement of Metabolic Parameters: The metabolic parameters (Cholesterol, Triglyceride, HDL, VLDL, and LDL) were estimated in the serum using spectrophotometry based kits (Span Diagnostic Ltd., Surat, Gujarat, India). Isolation of Serum: Under light diethyl ether anesthesia, Blood was withdrawn from retro-orbital plexus of anesthetized rats. They were kept at room temperature for 30 min, followed by centrifugation at 1000 g for 15 min. Serum was isolated by aspiration 14. Statistical Analysis: All the data obtained from the in-vitro and in-vivo experiments were expressed as mean ± SEM. Statistical analysis was performed by one-way analysis of variance (ANOVA), followed by Tukey's test using GraphPad Prism 5.0 software. P<0.05 was considered statistically significant. RESULTS: The preliminary phytochemical screening of the methanolic extract of W. somnifera showed the presence of alkaloids, glycosides, flavonoids, saponins, carbohydrates, starch, and tannins Table 1. FIG. 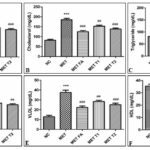 1: EFFECT OF METHANOLIC EXTRACT OF WITHANIA SOMNIFERA AND FOLIC ACID ON SERUM (A) Homocysteine (B) Cholesterol (C) Triglyceride (D) LDL (E) VLDL and (F) HDL in normal and methionine induced hyperhomocysteinemic rats. NC= vehicle (10 ml/kg, p.o) treated normal rats, MET= L-Methionine (1 gm/kg, p.o) induced hyperhomocysteinemic rats, MET FA= folic acid (1 gm/kg, p.o) treated hyperhomocysteinemic rats, MET T1=Methanolic extract Withania somnifera (200 mg/kg, p.o.) treated hyperhomocysteinemic rats. MET T2= Methanolic extract W. somifera (400 mg/kg, p.o.) treated hyperhomocysteinemic rats. ***P<0.001 vs. NC. #P<0.05, ##P< 0.01 and ###P< 0.001 vs. MET. Serum concentration of homocysteine was found to be significantly (P<0.001) increased in L-methionine treated group as compared to the normal control group. Treatment with methanolic extract of Withania somnifera (200 mg/kg and 400 mg/kg) significantly reduced, serum homocysteine level (P<0.01, P<0.001 respectively) in L-methionine induced hyperhomocysteinemic rats compared to untreated rats. Further, folic acid treatment showed significant (P<0.001) reduction in the serum homocysteine level in hyperhomocysteinemic rats compared to untreated rats Fig. 1A. Serum cholesterol, triglyceride, LDH, and VLDL levels were found to be significantly increased in hyperhomocysteinemic rats as compared to the normal control. Conversely treatment with methanolic extract of Withania somnifera (200 mg/kg and 400 mg/kg) significantly decreased serum triglyceride (P<0.01, P<0.001 respectively) level, serum cholesterol (P<0.01, P<0.001 respectively) level, serum LDH (P<0.01, P<0.01 respectively) level, and serum VLDL (P<0.01, P<0.001 respectively) level in L-methionine induced hyperhomocysteinemic rats. Treatment with folic acid significantly reduced serum triglyceride (P<0.001) level, serum cholesterol (P<0.001) level, serum LDH (P<0.001) level, and serum VLDL (P<0.001) level in L-methionine induced hyperhomocysteinemic rats Fig. 1B-E. L-methionine treated groups showed a significant reduction in the serum HDL level as compared to normal control group. Treatment with the methanolic extract of Withania somnifera (200 mg/kg and 400 mg/kg) and folic acid significantly (P<0.05, P<0.01, P<0.01, respectively) increased the serum HDL level as compared to untreated hyperhomocysteinemic group Fig. 1F. DISCUSSION: Withania somnifera is a vital medicinal plant traditionally utilized in the treatment of numerous diseases 15. Beyond these traditional uses, the present study is first to reveal the beneficial effect of W. somnifera in improving the homocysteine level, and lipid profiles in L-methionine induced hyperhomocysteinemia. Hyperhomocysteinemia has recently emerged as an independent and major vascular risk factor in cardiovascular diseases. The reported study suggest, elevated homocysteine level promotes atherogenesis and atherothrombosis via several potential mechanisms involving oxidative stress, increased lipid peroxidation, platelet adhesiveness, vascular smooth muscle cell proliferation, reduced nitric oxide synthesis, and endothelial cell damage 16. Furthermore, several epidemiological studies have also reported, increased risk of coronary artery disease, myocardial infarction, stroke, venous thromboembolism, and peripheral vascular disease in patients with elevated levels of homocysteine. Consequently, improving the homocysteine level may reduce risk in CVD. The previous likewise demonstrated, risk reduction in ischemic heart disease and stroke upon a decrease in homocysteine concentration 17. In the present study, we evaluated the homocysteine and lipid-lowering potential of methanolic extract of W. somnifera (200 mg/kg and 400 mg/kg, p.o.) in L-methionine induced hyper-homocysteinemia in rats. It is well reported that administration of L-methionine, intensifies the level of homocysteine as methionine undergoes transmethylation and convert into homocysteine 18. Hamet et al. revealed a relationship of hyperhomocysteinemia with inadequacy in cystathionine β synthase 19 which is merely an enzyme responsible for the catabolic elimination of homocysteine in mammals and also the rate-limiting step in the trans-sulfuration pathway 20. In the present study administration of L-methionine (1 gm/kg; p.o) for 30 days increased the homocysteine level. Conversely, treatment with the methanolic extract of W. somnifera (200 mg/kg and 400 mg/kg) significantly decreased the homocysteine level in the serum to hyperhomocysteinemic rats. Concerning the hyperhomocysteinemia condition, several reports have demonstrated increased lipid peroxidation with elevated serum homocysteine level 20. In this study, the serum level of cholesterol, triglyceride, LDL, VLDL were significantly increased whereas serum HDL level was decreased in L-methionine induced hyper-homocysteinemia. Moreover, the treatment with methanolic extract W. somnifera showed significant improvement in the lipid profile via reducing serum cholesterol, triglyceride, LDL, VLDL and increasing HDL level. Ultimately the methanolic extract of W. somnifera improved the homocysteine level and lipids profile in hyperhomocysteinemic rats. Consequently, the protective effect of W. somnifera may be due to the presence of high amount of catechin with potent antioxidant properties. The previous study has reported the role of catechin, in enhancing cystathionine β-synthase enzyme involved in the conversion of homocysteine to cystathionine 21. However, with this antecedent approach, the obtained results from the present study provide a shred of evidence that the consumption of W. somnifera may have the potential in improving serum homocysteine and the lipid profiles. CONCLUSION: Treatment of methanolic extract of Withania somnifera leaves showed improvement in homocysteine level and lipid parameters in L-methionine induced hyperhomocysteinemia. The protective action may be due to the presence of catechin in Withania somnifera. Gupta S, Gudapati R, Gaurav K and Bhise M: Emerging risk factors for cardiovascular diseases: Indian context. Indian J Endocrinol Metab 2013; 17(5): 806-14. Ganguly P and Alam SF: Role of homocysteine in the development of cardiovascular disease. Nutr J 2015; 14: 6. Claudiu S: Homocysteine - modest risk factor for deep vein thrombosis and pulmonary embolism. Maedica-A Journal of Clinical Medicine 2007; 2(2): 157. Giovanni R, Paola F, Fabiola M, Mabel M, Lucia S and Nicoletta B: Homocysteine and folate as risk factors for dementia and Alzheimer disease. Am J Clin Nutr 2005; 82(3): 637-43. Fonseca V, Guba SC and Fink LM: Hyperhomo-cysteinemia and the endocrine system: Implications for atherosclerosis and thrombosis. End Rev 1999; 20: 738-59. Tyagi N, Sedoris KC, Steed M, Ovechkin AV, Moshal KS and Tyagi S: Mechanisms of homocysteine-induced oxidative stress. Am J Physiol Heart Circ Physiol 2005; 289(6): H2649-56. Mishra LC, Singh BB and Dagenais S: Scientific basis for the therapeutic use of Withania somnifera (Ashwagandha) a review. Altern Med Rev 2000; 5: 334-46. Naidu PS, Singh A and Kulkarni SK: Effect of Withania somnifera root extract on haloperidol-induced orofacial dyskinesia: possible mechanisms of action. J Med Food 2003; 6(2): 107-14. Hamza A, Amin A and Daoud S: The protective effect of a purified extract of Withania somnifera against doxorubicin-induced cardiac toxicity in rats. Cell Biol Toxicol 2008; 24(1): 63-73. Sankar SR, Manivasagam T, Krishnamurti A and Ramanathan M: The neuroprotective effect of Withania somnifera root extract in MPTP-intoxicated mice: an analysis of behavioral and biochemical variables. Cell Mol Biol Lett 2007; 12(4): 473-81. Nadia A, Monzur H, Md IK, Mohammed M, Siti AS and Siew HG: High catechin concentrations detected in Withania somnifera (ashwagandha) by high-performance liquid chromatography analysis. BMC Complement Altern Med 2011; 11: 65. Hamelet J, Demuth K, Dairou J, Ledru A, Paul JL and Dupret JM: Effects of catechin on homocysteine metabolism in hyperhomocysteinemic mice. Biochem Biophys Res Commun 2007; 355(1): 221-7. Alam N, Hossain M, Mottalib MA, Sulaiman SA, Gan SH and Khalil MI: Methanolic extracts of Withania somnifera leaves, fruits and roots possess antioxidant properties and antibacterial activities. BMC Complement Altern Med 2012; 12: 175. Beladiya J, Chaudagar KK and Mehta AA: A protective role of Gαq-RGS2 loop activator on streptozotocin-induced diabetic complications in rats: An independent on elevated serum glucose level modulation. Eur J Pharmacol 2018; 818: 141-7. Patwardhan B, Panse GT and Kulkarni PH: Ashwagandha a review. J Natl Med Assoc 1998; 30: 7-11. Marcus J, Sarnak MJ and Menon V: Homocysteine lowering and cardiovascular disease risk: lost in translation. Can J Cardiol 2007; 23(9): 707-10. Homocysteine Studies Collaboration. Homocysteine and risk of ischemic heart disease and stroke: a meta-analysis. JAMA 2002; 288(16): 2015-22. Blom HJ and Smulders Y: Overview of homocysteine and folate metabolism. With special references to cardiovascular disease and neural tube defects. J Inherit Metab Dis 2011; 34(1): 75-81. Hamelet J, Demuth K, Paul JL, Delabar JM and Janel N: Hyperhomocysteinemia due to cystathionine beta-synthase deficiency induces dysregulation of genes involved in hepatic lipid homeostasis in mice. J Hepatol 2007; 46(1): 151-9. Yun Z, Shuqing W, Xiujie G, Zhiqing Z, Jingbo G and Rui Z: Inhibition of cystathionine β-synthase is associated with glucocorticoids over-secretion in psychological stress-induced hyperhomocysteinemia rat liver. Cell Stress Chaperones 2013; 18(5): 631-41. Hamelet J, Demuth K, Dairou J, Ledru A, Paul JL, Dupret JM, Delabar JM, Rodrigues-Lima F and Janel N: Effects of catechin on homocysteine metabolism in hyperhomocysteinemic Biochem Biophys Res Commun 2007; 355(1): 221-7. Patel S, Thakur V and Parmar H: Effect of Withania somnifera (Ashwagandha) leaves extract on L-methionine induced hyper-homocysteinemia in rats. Int J Pharmacognosy 2019; 6(2): 75-79. doi link: http://dx.doi.org/10.13040/IJPSR.0975-8232.IJP.6(2).75-79. Authors Address: Department of Clinical Research, Pharma Zone, Ahmedabad, Gujarat, India.